Sparring – Why Women (and Men) Should Do It – a personal message from Oriana. Once a year our whole Club gathers for a day of competition. There are patterns competitions, physical challenge competitions (you wouldn’t believe who wins the iron-bridge! ), and the much-anticipated sparring competitions. The highs, the lows, the tears, the occasional blood and plenty of bruises. When the sparring finals come up we gather around the mats as exhausted competitors silently scream “Are you not entertained?”. But sparring is for everyone, not just for gladiators. 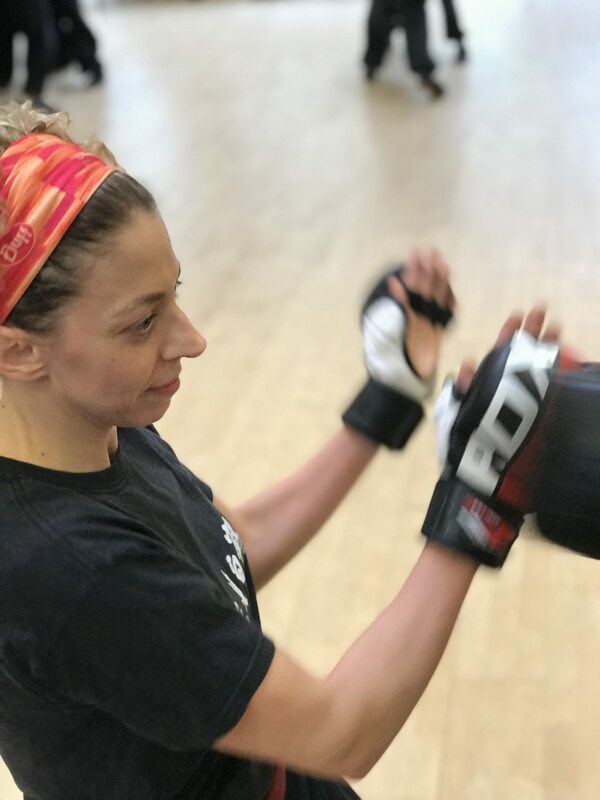 Oriana Pagano, who trains with Instructor Dave Courtney Jones, puts forth a passionate argument calling for more women (and indeed, men) who train with us to take up the gauntlet and try sparring. “April 2017, Fujian White Crane Kung Fu Club competition. I’m standing near the mat, watching two fellow students spar. I’m still wearing my sparring gear, but I’m relaxed: the women’s competition is over. A young woman, also a Club student, comes and stands next to me to watch the fight. I’ve never seen her before. “You were very brave,” she tells me after a while. I turn to her, puzzled. “To do the sparring” she adds, reading my confusion. Wait a minute. That. Why? Before I know it, we are deep in conversation – the men’s fight blurring into the background noise. The more we talk, the more I get the feeling that she would love to try sparring – yet something is holding her back. So I push on, arguing my case, rattling off all the benefits of sparring, stressing how important it is, especially for women. For some reason, I want to convince her. We talk some more until the full-contact sparring brings us back to the competition. We are going to watch it from different corners, so we say goodbye and part ways. Now I don’t know whether I managed to inspire that young person to give sparring a try, but our conversation got me thinking. 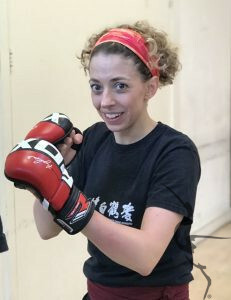 The fact that, out of all the female students of all the FWC Clubs across London, only three (including myself) signed up for the sparring competition, got me thinking. Why aren’t more women sparring? What is holding them back? The truth is, I’m not sure. Personally, I didn’t have any problem with sparring when I started doing Martial Arts. Yet, I can still empathise with women who do. I can try to understand why they feel that way, what it is about sparring that is putting them off. Fear is probably the number one reason. After all, isn’t fear usually the top reason why we refrain from doing something that we may need or enjoy? Some people don’t travel because of fear. Some people don’t change job because of fear. Some people stay in unhappy relationships because of fear. The list could go on and on. Most of the time, it is an irrational and unjustified feeling, yet it is always a powerful one. It shouldn’t surprise, then, that somebody could initially be afraid of sparring. Whilst Club sparring is not a risky activity (with safety gear and supervision) the idea of engaging with another person in a fight can be scary. What if I get hit? What if I get hurt? What if they hit me in the face? When you have never done something, you don’t know what to expect – and that in itself is what makes it scary. Most boys get involved in rough and tumble when growing up. Also they are more likely than girls to get involved in contact sports, like rugby or soccer. So whereas boys deal with physical confrontation quite early in life, girls are less likely to be familiar with it. Unless blessed with a very annoying older brother (like I was) most girls grow up without ever experiencing what it’s like to be in a fight to be hit. So when a woman tries sparring for the first time, it may indeed be her very first physical confrontation. She doesn’t know how it works or what she is supposed to do, and, as an adult, that makes her feel uncomfortable. Willingly or not, we are all influenced by social constructs, by conventions and perceptions created and maintained within our society. Concepts like “fighting is a man’s job” and”real ladies do not fight” are not that easy to eradicate from the general perception. Even feminist and emancipated women who don’t agree with these views may fall into the misconception that sparring is a “guy thing” and is not for them. They may not believe it, but the perception may still be there, deep down, working its way in their subconscious. Honestly, I don’t know whether I’m right or wrong about any of this. There are probably other reasons why women are less inclined to sparring, and I would love for this article to spark a conversation on the subject. What I do know, and firmly believe, is that women should spar. I’ll give you five good reasons. 1) If you do a Martial Art, train like a Martial Artist. Kung Fu is a martial art. Fujian White Crane Kung Fu is a fighting style. The movements we learn in class, whether defensive of offensive, are all meant to be used in an actual fight against one or more opponents. Training Kung Fu without doing any sparring would be a bit like learning to play tennis without the ball: sure, with practice, you can master the movement of the forehand, the backhand, the service – but would you say that you can play tennis? If you never test and practise your blocks, your punches, your kicks, against a real opponent, how can you learn how they work? How can you learn how and when to use them? Also, why are you practising them in the first place, if you’re not willing to use them for their very own purpose? 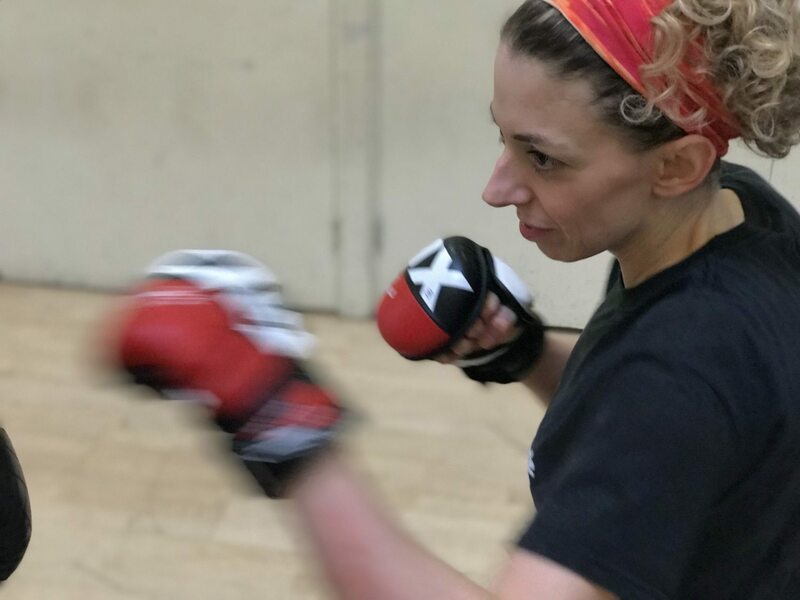 Facing and overcoming fear is incredibly empowering: by deciding to put your gloves on and spar with a fellow student, you put yourself in a new situation, you step out of your comfort zone. And stepping out of your comfort zone is what makes you grow. No matter how you do you will learn from the experience and both yourself and your Kung Fu will be better for it. People take an interest in Martial Arts for various reasons. Every person’s journey is unique, and we all find something different in our training, Self-defence may not be the reason why you started training Kung Fu, but what we learn in class has been perfected through hundreds of years to do essentially that: provide you with an efficient means of self-protection. Whilst I hope I will never need to use my Kung Fu skills to defend myself or protect others, I still would like to know that they are as good as they can be, should the need arise. That’s why we need to spar. If you want to have a chance at using your Kung Fu to protect yourself , you need to put what you learn in class into practise. You need to see what you’re doing wrong, what works, and what doesn’t. You need to discover your strengths, and build on them. You need to spot your weaknesses and learn how to make up for them. You need to get corrections and tips from your Instructor so you can improve. And you can only do that if you spar. While this may be true for any Martial Arts student, it is particularly important for female students. As women, unfortunately, we are more likely than men to be physically attacked. We are also most likely to be attacked by a man, and thus likely to be up against somebody who is stronger than us. So we must be prepared. Sparring is an amazing way to do that, as it provides you with an opportunity to engage in a fight in a friendly, safe and controlled environment, often against a bigger and stronger opponent, and see how it feels. As humans, we learn through experience, and the best way to learn how to defend yourself in a fight is to experience it, over and over again. 4) You won’t know until you try. The Importance of Being Hit. Although the fact that most women grow up without ever being in a fight or being hit is a good thing, it could become a hindrance the moment they get attacked. If you’ve never been attacked or hit, the first time it happens you are most likely going to freeze. You feel the pain, your brain doesn’t know how to process it, and fear takes over: you panic, or freeze, or both. Which, of course, is the last thing you want to happen, should you find yourself in danger. With sparring, you can train your brain and body to overcome that first natural reaction. Although the objective is not to hurt your opponent but rather to challenge each other so that you both can improve, when sparring you will face multiple attacks and, sooner or later, you will get hit. You are not going to like it, but it is part of your learning curve. It teaches you how to take a hit and keep going. You will learn how to control your emotions, so that fear doesn’t take hold of you, and rage doesn’t make you lose your focus. You will learn to block better. Most importantly, should you ever be attacked by surprise, you don’t have to freeze: your brain and body will know how to react. And that, in my opinion, is well worth a few seconds of pain or a couple of bruises. is extremely powerful, as it builds up your confidence, both in yourself and in your Kung Fu skills. Sparring will make you confident, and confidence shows. It shows in the way you carry yourself, in how you act around people. So the next time someone sees you walking down the street – a strong, confident woman – they might think twice before coming over to harass you. I believe women can be great at sparring, and that often they are held back from trying simply by a preconceived idea that fighting is dangerous or not for them. I hope that this article can help change this misconception and inspire more women (and of course men, too) to take up sparring. A note on the photos : In full sparring we use safety equipment relevant to the drill/training being done. The photos here were taken during a non-striking blocking drill with gloves only.